NeenerNeener.Net > Tales of the MMO > JG > JumpGate nothing, this is CRASHGate. JumpGate nothing, this is CRASHGate. So. Some of you may or may not have heard about my latest obsession: JumpGate. It’s basically this hyped-up version of Wing Commander : Privateer. In that you fly a ship, you can trade stuff, shoot stuff, mine stuff and crash into stuff. Out of those four options, I’m getting REALLY good at crashing into things. Like, REALLY good at it. In fact, if they gave out experience points for that, I’d have maxed out my rank in my first day and they probably would’ve had to create a new level cap just for me. Basically, you zip around from station to station, blowing up the evil aliens, mining from asteroids, fleeing from pirates and finding unique ways to die. Traveling from sector to sector is accomplished via JumpGates – wormholes in space that are kept stable via some fancy warp thingies. 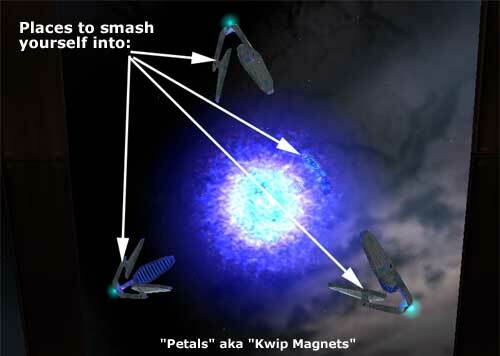 In game, people call these devices “Death Petals” or just “Petals,” because they look like flowers. Personally, I call them “Things You Will Crash Into At A Billion Miles An Hour And Splatter Like A Watermelon”. The thing that’s tricky about these JumpGates is that you will come out the other side at whatever speed you’ve set your throttle to. So most people zero their throttle as they enter the gate. Not me though! Lawks, no! That’d be too easy! For whatever reason, I maintain a velocity of what has been proven to be physically impossible for my ship to achieve as I come out. So then I’m back at the station, and I have to re-equip my ship. That takes me about two years. See, there’s GOOD bits and BAD bits to put in your ship. I keep picking the bits that are so bad they make my ship explode as soon as they’re loaded. But now I’ve given up on these silly transport missions. I’m going to mine some roids! Yaaaah, baby! I get set up with a couple of mining lasers and away I go. Now there’s all sorts of ways to mine, and all sorts of roids to mine from. 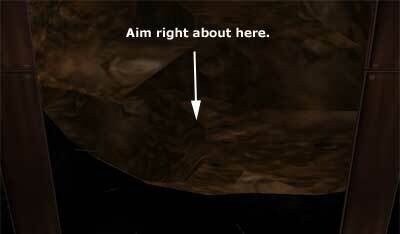 However, the really GOOD ones are in the more dangerous sections of space. So I charge out there, and only when I’ve got a billion alien monsters closing in on me do I realize that my mining lasers don’t do any damage to alien ships. So now I’m back at the station. Two years, re-equipping. But this time, THIS time I’m not leaving this sector! Heck no! I’m gonna just mine some nearby roids, get some common ores, and sell them off. It’s an agonizingly slow process, but it’s a SAFE process. Sigh. One thing that’s fun in the game, though, is that from time to time the aliens will ‘infest’ jumpgates. They grow some funky thing over the gates so you can’t use them. How do you get rid of them? Why, the same way you get rid of any annoyance: nuclear weapons! But I’m working hard. I’m ALMOST able to take a flux. Provided it’s a little one. That’s been crippled. And I’ve got a few nukes.